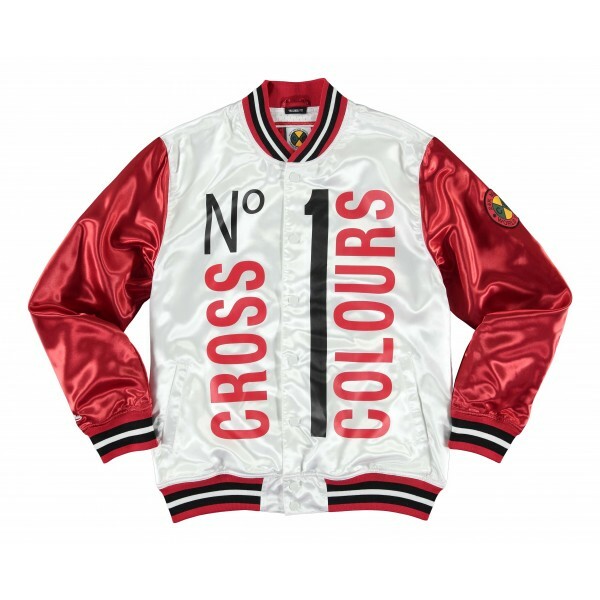 The Bruno Mars '24K CxC' Satin Warm Up Jacket was customed designed on a red and white Mitchell & Ness satin jacket.100% polyester satin. 2x2 knit striped rib on collar, cuff and waistband red, black, and white color blocked sleeves. Snap front closure. Front welt pockets. The body of the jacket is white and features 'No 1 Cross Colours' printed in red and black. The sleeves are red with a Cross Colours patch on the upper left and the Mitchell & Ness logo embroidered on the bottom right. The back of the back features 'XXIVK Magic' printed in black. Below that, 'World Tour' is printed in red with the Cross Colour logo in between both words.